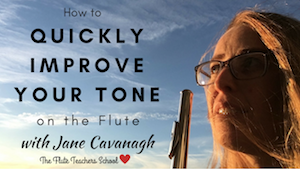 How to Get EVEN DOUBLE TONGUING on the FLUTE! A few years ago, when I started making videos to help flute players online, there was one particular 60-ish-year-old, Dan, who was sooo keen to learn and improve his playing. Dan was the first person who lived internationally (the US) who took up my lessons and started improving out-of-sight when he applied what I taught him. It was honestly incredible to have such support and enthusiasm right at the start of my business - back in 2015. But there is one thing that Dan has still been wondering. It is how to coordinate his double tonguingso that hisfingers and tongue are even. So I made him (and you!) a video on HOW TO DIAGNOSE whether it is your tongueor your fingersthat are the culprit for uneven double tonguing. * If you have no idea what double tonguing is, sit tight - there'll be plenty more videos in the future that are especially for you! * If you're a teacher, then indeed, why not try out this diagnosing method with your advanced flute students?